I think I am addicted. Addicted to building fly rods. Here is my latest build. 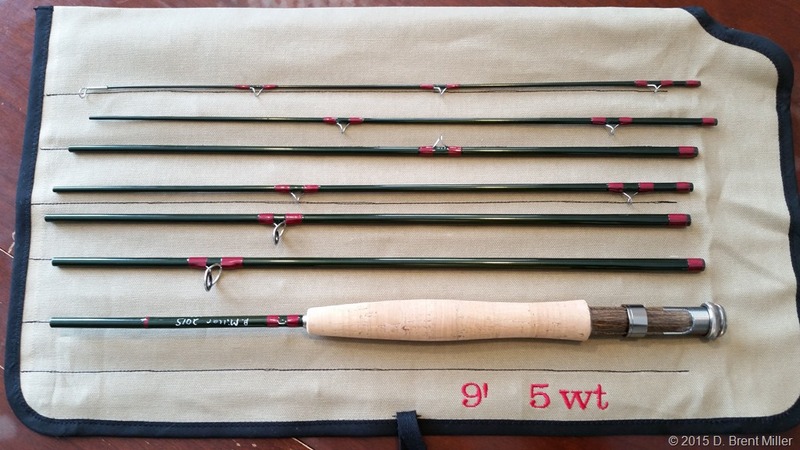 It’s a 9’ 5wt 7-piece rod with a custom rod bag. Broken down like this and packed, it’s only 18 inches long. Assembled, it’s 9’. This is perfect for taking on motorcycle trips. There’s nothing like catching fish on a rod you built with a fly you tied. Do you motorcycle and fly fish? I am guessing you have an inside connection for that custom bag. Great looking rod, Brent. You have a great hobby. Beautiful Rod I like it. Well done, Brent! That’s a real beaut. I scour Craigslist and eBay for fly rods I can easily pack in my saddle bags. Looks like you’ve done it. So, where can we find these for sale? I bought the kit from Hook & Hackle on sale. I just managed to get a really, really good deal. And then, I built the rod out. Here is the link: http://store.hookhack.com/HH-Xi-Fly-Rod-Kit-9-5-weight-7-piece/productinfo/XI9057K/. There are others who offer 7-piece rods, including Orvis and LL Bean. I preferred to build my own.